Eerily drifting through soft fades, superimposed images, close-ups, and visual feedback, this tape follows less a narrative structure and more a stringing together of seemingly random activities, set against two very different soundtracks. The video opens with David Cort reclining on the ground as psychedelic rock plays in the background. Two shots alternate between frontal and profile as he lazily plays with his beard and face – the streams of footage melding together with the use of live editing. An abrupt cut brings the viewer to the source of the other video-camera, Mary Curtis Ratcliff. She poses as a close-up zoom on her face eventually dissolves into a grainy, grey-scale undecipherability. As the field of view returns to normal, she laughs and the camera cuts again. 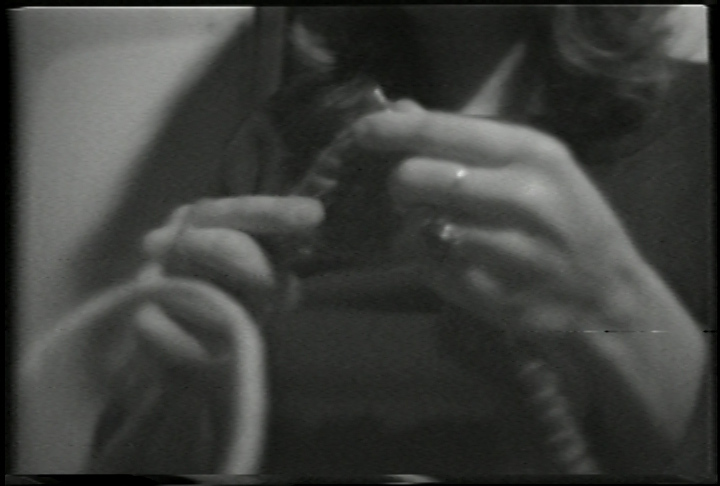 From here, and for the remaining duration of the tape, the viewer is shown Carol Vontobel quietly knitting – as the voice of Richard Nixon is heard via radio delivering a speech at a university. Comprised of alternating, meshed images – Vontobel steadily at work, and passages of televisual feedback – the video gets its title from the interplay of these two sequences. It subtlety combines socio-political commentary with formal experimentation, existing between the two dominant modes of video art. Traditionally associated with femininity and subordinated as women’s “busy work,” Vontobel’s knitting provides a source of distracted attention, displaced away from, and in spite of, Nixon’s anti-protest rhetoric droning on out of frame. As images of her bleed into closed-circuit feedback, one gets the feeling of human-machine parallels. Just as she is engaged in the continuous looping of threads, the video-apparatus itself is looping its own signals between screen and viewfinder.